I've had the car for about a month and a half now. I kept meaning to do a review but things always seem to get in the way, well today is the day. I picked up this car on one of my local Hobby Lobby runs to pick up some paint for my customs. For anyone who's shopped at Hobby Lobby before they always have a 40% off one item coupon. It was originally $19.99 so with 40% off I only ended up paying $11.99 for this which is a pretty good deal in my opinion. Overall the quality is very good on the car, they are a ton of details on it. The paint it is nice and clean and they even managed to paint the grill piece a darker gray just like the real DeLorean had. All the little molding pieces around the side and rear of the car really give the car a lot of character. 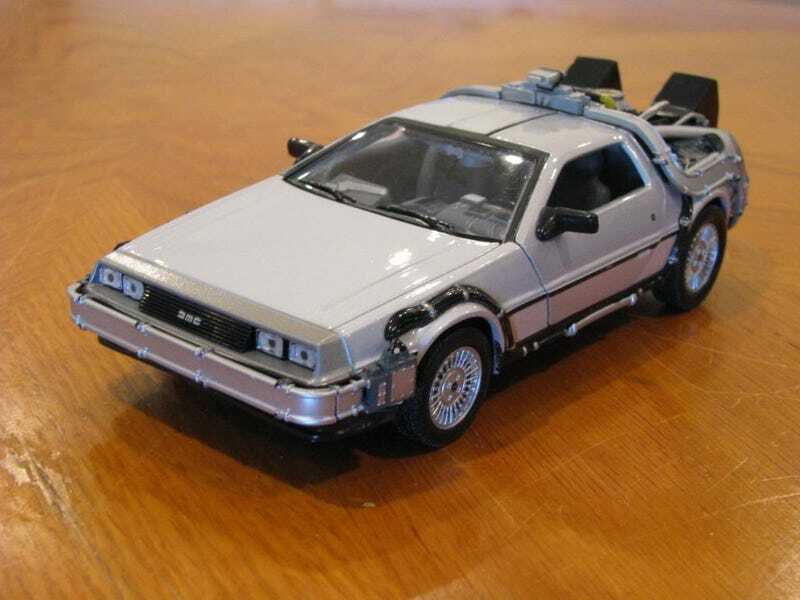 My favorite part of the car as far as details are concerned are the Time machine parts in the rear of the car. They really did a good job getting alot of the details in the back part of car from the plutonium chamber to the louvered exhaust. There even a spot for the lightning rod when I'll get to a little bit later. As far as the interior goes they did a pretty good job getting the key items molded into the interior, specifically the time circuits a the flux capacitor. The interior could have used a little more on the paint detailed but for a $20 1:24 car its pretty much a given your are going to get the bare bones. A little touch up painting would do this interior some good. Just like any fan of the DeLorean the favorite feature that everyone loves is the gull wing door. The doors on this car are fully fucntioning and they stay in place when they opened, they don't fall back down under their own weight. I will say one my disappointment with the car is the lack of turning front wheels or detailed suspension. The tires are basically just attached on bar that goes straight through plastic car bottom. They did however do a good job on the rims and even got the DMC logo painted on it. The one cool accessory that came with this car is the lightning rod that goes on the back of the car that's used at the end of the movie. They did a pretty good job on the details and theirs even a nice spot on the back where it attached to the car. Even though the spot isn't in the right, it should technically be inserted in the plutonium chamber its still a nice addition. Overall I would say that if you are fan of the movie and really want a fairly detailed copy of the movie this is right up your alley. I think its worth the $19.99 price tag and at $11.99 its a great deal if you have a Hobby Lobby in your area. Thanks for looking and taking the time to check out my review.